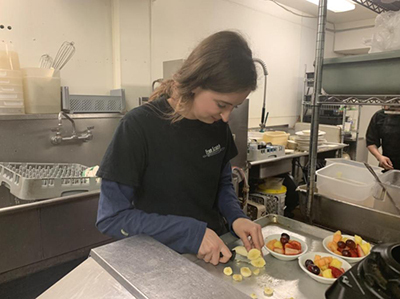 At various points during her high school career, Meredith Bond could be seen blending smoothies for impatient customers over the summer or folding khakis in the back of a shop in Carmel after school. Avery Cripe might spend his afternoons and weekends doing garden work at the Holly Farm, and Leah Boylan could be spotted making coffee in Carmel one day a week. These are only a few of the many working students at CHS, whose jobs range from making beverages to doing maintenance to folding clothes. Balancing school, work and extracurriculars in high school is no small feat, and students report that one of the most valuable takeaways they gained through working in high school is how to manage their time and prioritize. This is a consistent sentiment among working students, most of whom express that they put school first and then schedule their shifts around their academic obligations. Working during high school can teach students skills that they might not receive in the classroom, but are just as valuable as learning algebra and chemistry, time management and prioritization being among the top. According to a number of student employees from CHS, having a job and going to school require tough decision-making about how many shifts they can work and when it is time to take a break to focus on school. According to Bond, when her summer job at Jamba Juice became too much a commitment when school started, she put in her two weeks’ notice and stopped working for a few months. “I was stressed out a lot and my work environment was really stressful sometimes,” says Bond, who a few months later went on to get a job working at Khakis in Carmel, a less demanding and more convenient position for the senior. In high school, most students first get jobs in order to earn money, whether to pay for a large expense or simply to have their own cash to spend. “I got a job to buy my car, and I’ve paid for half of it so far,” says Boylan, a junior who works as a barista. Whether students are paying off an expense or earning spending money, many report that working has helped them learn how to manage their money, a skill not taught extensively in high school. “My mom took half of my paychecks and put it into a savings account,” Bond says. Without having a job, high school students rarely have a source of income and don’t gain experience with saving until well after high school, when it is highly beneficial to already be proficient in finances. According to junior Marcus Lo, however, there is much more to be gained from working than simply a paycheck. “I’m not doing it just for the money, I’m doing it for the experience,” says Lo, who works for his uncle at his dermatology practice. While many teens simply take whatever job they can get, students often try to gravitate towards things that interest them and that they enjoy. “I thought it would be cool to talk with the Chinese tourists down there because I speak Chinese,” says junior Jack Jarvis, who spent a summer working at the Carmel Drugstore interacting with both locals and the large tourist population in Carmel. Garderet, who works with kids at CVAC teaching them to swim and play sports, emphasizes how working with children has fueled her interest in pursuing child psychology after high school, and spending time with the kids is something she really enjoys. There is a great variety of jobs CHS students have, some much more conventional than others. Junior Yvonne DiGirolamo spends one day a week cleaning out decorative water features around the area, a business her dad owns and that she started helping over the summer. “I go to the pond once a week and I check the water, weed out the plants, and I take this giant brush and scrape out the sides of the pond and the bottom to stir up all the dust,” DiGirolamo describes. Cripe, who works at a wedding venue in Carmel Valley, spends his weekends tending to the facility’s gardens during the long shifts where he is one of the only high schoolers working. Not only does working in high school aid in time management and financial literacy, but many students report that their jobs have helped them learn how to work with others, specifically adults. “It really helped me with working with other people in stressful situations,” Jarvis says of his time working at the Carmel Drugstore. Working in customer service teaches valuable social skills, Bond recalling how much working at Jamba Juice made her reevaluate interactions between customers and servers. “Working opens up that level of maturity and you kind of see what you’re going into and what to get ready for,” Cripe says. Working in high school gives students real-world experience dealing with people and working as a team in situations that would otherwise not arise in a school setting. Many students also report that getting a job early showed them that they are capable of maintaining their lifestyle and taking care of themselves independently from their parents, increasing their confidence as they leave high school and enter college and the workforce.